Inverse kinematics (IK) is the use of equations to drive a system of connected components so that an end effector can reach a desired position. Imagine a robot arm formed of a series of sections hinged together. With traditional animation techniques, if you wanted the hand of the arm to reach to a specified position, you would have to code the rotations for each of the joints, which is a complex and time-consuming task. With IK, you simply need to specify the required position of the hand (which would be the end effector), and each individual joint is rotated to achieve the final position. 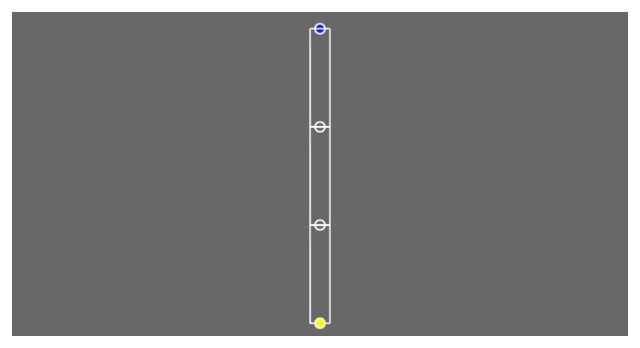 In SpriteKit, complex IK animations can be generated with very little code. SKAction object reach methods that solve an IK system (that run the system to make the end effector reach a specified position). SKConstraint objects that constrain the position or orientation of nodes. Listing 1 creates a simple robot arm consisting of a fixed shoulder node and upperArm, midArm, and lowerArm sections that are joined by elbow and wrist nodes. At the end of the wrist is an endEffector node. The nodes are progressively children of each other. The shoulder node is fixed to the scene with a constraint, and the other joints are offset in the y direction by the length of each section. 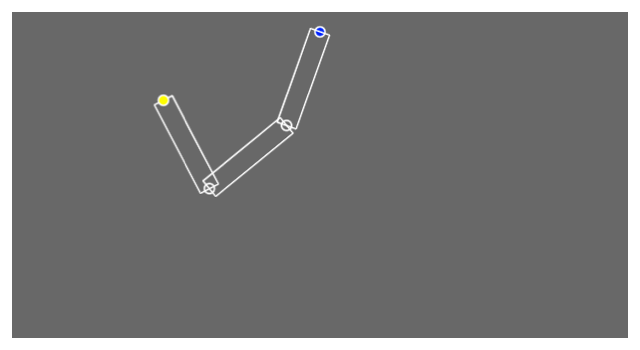 In its default position, the code above creates a node tree that looks like this (the shoulder is at the top, in blue, and the end effector is at the bottom, in yellow). To run the IK solver, you create an action passing it the desired location.